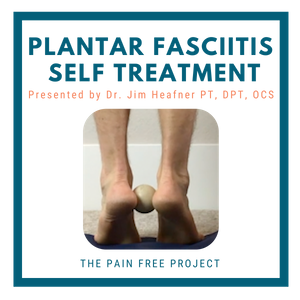 The Pain Free Project helps you get rid of your pain through movement and education. 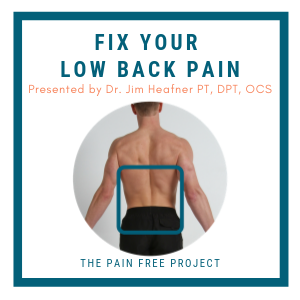 Founder, Dr. Jim Heafner PT, DPT, OCS, guides you through corrective exercises, soft tissue self massage videos, and pain neuroscience education (a.k.a understanding why you are having pain). His 3-part system has worked for thousands of his patients and can work for you! 2) Reprogram: Start incorporating strength and flexibility movements into your life. Click below to learn about all our pain management and movement programs! From rehabilitation exercises to advanced performance, The Pain Free Project guides you from pain to higher levels of exercise. Each body region offers basic, intermediate, and advanced movements depending on your individual level. 'Soft tissue' includes the muscles, fascia, tendons, ligaments, and more! For our soft tissue self massage videos, we target the muscles and fascia by using a foam roller or soft tissue ball. The purpose of these techniques is to relax the area of discomfort and calm symptoms. We like to think of these videos as 'resetting' your system. Knowledge truly is power when is comes to getting rid of pain. Our educational content will help you understand the ups and downs of recovering from an injury. During this process it's important to be aware of the mental and physical aspects of pain. It is our hope that our programs' education will help you out of pain today, and keep you stronger in the future. Many people live in pain and discomfort, and have not made the choice to seek treatment. For example, you may have pain while reaching overhead, bending forward, or going down the stairs. You may be trying to ignore the pain or simply believe it is due to getting older. However, these are not a result of aging, but due to a lack of strength, flexibility, or movement through that area of the body. When Jim is not treating patients in the clinic, he focuses his attention on educating fellow physical therapists in the profession, writing, and educating others. He has authored 3 books including Making Sense of Pain, The Yoga Fix, and The Guide to Efficient Physical Therapy Examination.